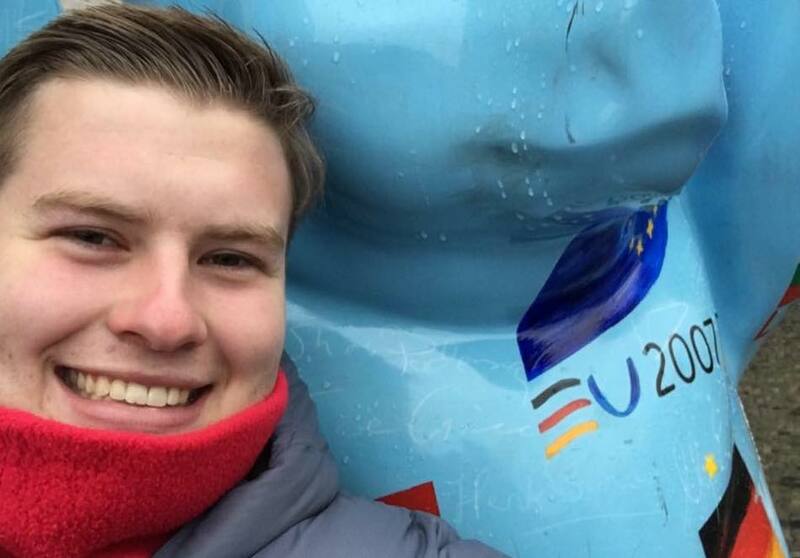 Find out how Alec was able to land a job at Westpac as a result of his work with AOS! What role will you be doing next year at Westpac? What excites you about this? Next year, I’m taking up a Finance and Accounting Graduate position at Westpac in their Group Finance division, which will go for two years and comprise of four six month rotations across different arms of the organisation. Although most people look at me like I have three heads when I say I’m going to work in a Bank, I think it is a great opportunity to get an exposure to multiple different markets and financial operations within Australia while also getting into the job market with a well known/renowned employer. 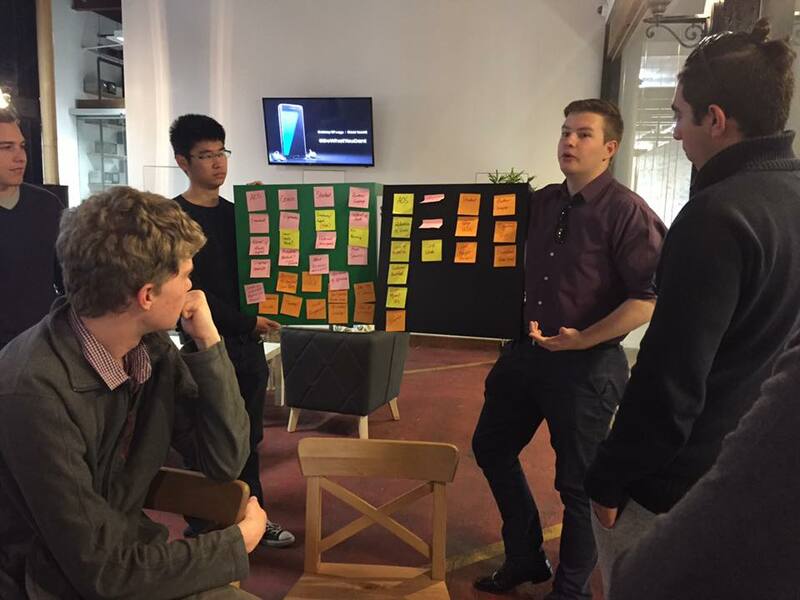 What prompted you initially to apply to join the Art of Smart team? Honestly, I joined Art of Smart as it was what I saw as an ‘easy’ job. During high school I had worked at a fast food restaurant and while that was a learning experience it was a thoroughly unpleasant learning experience. I felt that I had a good innate ability to teach and that working with kids would be easier and to some extent beneficial in ensuring that I remembered the content I learnt in school. What skills have you learned and developed in your time at Art of Smart? However, once I joined Art of Smart I quickly learned that working here was a learning experience, and wasn’t unpleasant at all! 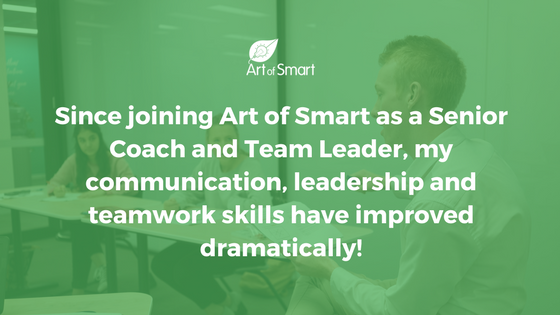 Since joining Art of Smart I’ve felt that my communication, leadership and teamwork skills have improved dramatically both as a result of working as a coach and as part of my roles on the Senior Leadership Team and as a Team Leader at UNSW. Through working with a wide range of subjects, age groups and ability levels I’ve learnt a whole set of new ways to explain concepts. Parallel to this is the ability to talk to parents and communicate long term plans and outcomes to them. How did Art of Smart support you in developing these skills? Another key skill I’ve learnt which was incredibly helpful when completing the Assessment Centre interview stage at Westpac was the ability to work with others to develop a long term plan. This I developed in depth working with the Senior Leadership Team to help implement programs such as the Team Leader program, as well as the new Coach of the Month program. What’s been your favourite/most rewarding experience while part of the Art of Smart team? The cliche would be working with students, but honestly this has been one of the most rewarding experiences, I have really enjoyed working with my current Year 12 Economics student. I’ve been working with him since the start of Year 11 and seeing him develop his skills and improve has been incredibly rewarding. A close second would be helping to develop the Art of Smart Team Leader program and being part of the roll out of the position. How do you feel your work at Art of Smart contributed to you successfully being offered a role with Westpac? 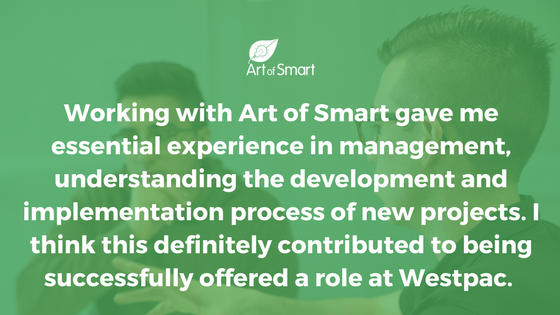 I think one of the big benefits that Art of Smart provided me when interviewing was the experiences that working in the Senior Leadership Team and Team Leader Program provided me in working with management, understanding the development progress of taking an idea and subsequently implementing it. This when paired with the improved communication skills allowed me to feel at ease when discussing my resume with interviewers and showing off my skillset. How can other coaches make the best use of their time with Art of Smart to develop their skills? I would say to current coaches to get involved with the programs available here which you don’t get at other tutoring companies or other employers for Uni students. Jump on opportunities such as blogging, the Senior Leadership Team, becoming a Team Leader, volunteering, as they are easy ways to develop skills as well as differentiate yourself from other applicants.